Bhubaneswar (Odisha) [India], Apr2 (ANI): With two late goals, ATK beat a resilient Real Kashmir FC side 3-1 in the Hero Super Cup pre-quarterfinals played at the Kalinga Stadium in Bhubaneswar. 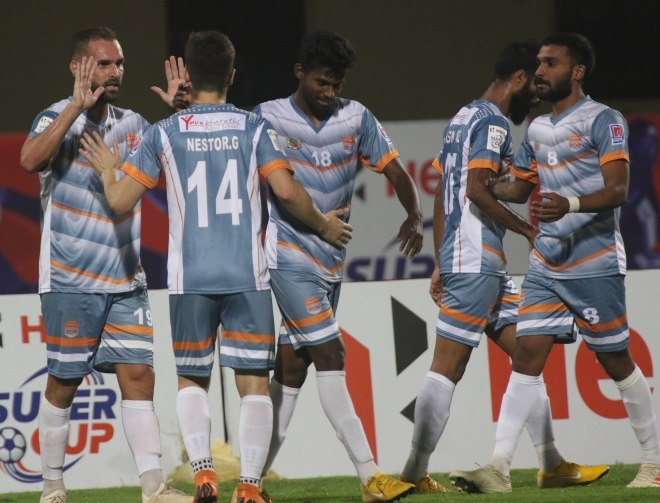 Bhubaneswar (Odisha) [India], Mar 30 (ANI): Chennaiyin booked their passage into the quarter-finals of the 2019 Hero Super Cup with a well-played 2-0 victory over fellow Indian Super League side Mumbai City at the Kalinga Stadium in Bhubaneswar. Bhubaneswar (Odisha) [India], Feb 16 (ANI): Myanmar clinched the Hero Gold Cup crown in style, edging Nepal 3-1 in the final at the Kalinga Stadium in Bhubaneswar. Bhubaneswar (Odisha) [India], Feb 13 (ANI): India women’s team suffered their second defeat in the last round-robin match of the Hero Gold Cup as Myanmar ran away with a two-goal victory at the Kalinga Stadium on Wednesday. Bhubaneswar (Odisha) [India], Feb 12 (ANI): In spite of suffering a 1-2 defeat at the hands of Nepal in their second game of the Hero Gold Cup at the Kalinga Stadium, India women’s team head coach Maymol Rocky said that the result was a minor blip. New Delhi [India], Feb 1 (ANI): Indian senior women’s football team will face Iran in their opening match of the Hero Gold Cup at the Kalinga Stadium in Bhubaneswar, beginning on February 9. Bhubaneswar (Odisha) [India], Nov 30 (ANI): Hockey fans attending the biggest sporting extravaganza in the country, 2018 Men's World Cup, are being treated to games and fun activities installed in the Fan Village spanning about 18,000 sq meters inside the Kalinga Stadium. New Delhi [India], Nov 19 (ANI): The inaugural function of the 2018 Men's Hockey World Cup, which was earlier scheduled for November 27 at the Kalinga Stadium, will now be held in two parts. New Delhi [India], May 30 (ANI): Hockey India on Wednesday congratulated Col (Dr.) Bibhu Kalyan Nayak for being named as the FIH Medical Officer for the prestigious 2018 Odisha Hockey Men's World Cup. Bhubaneswar [India], Feb 28 (ANI): The Indian men's hockey team is grouped along with 2016 Rio Olympic silver medalist Belgium for the 2018 World Cup scheduled to be played at home from November 28.